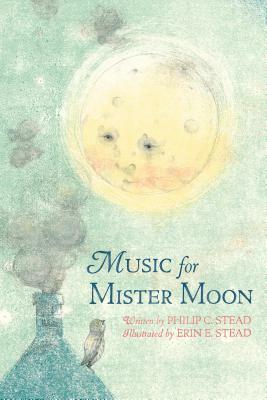 Music for Mister Moon (Hardcover) | Turnrow Book Co.
A girl named Harriet longs to play her cello alone in her room. But when a noisy owl disrupts her solitude, Harriet throws her teacup out the window and accidentally knocks the moon out of the sky in frustration. Over the course of an evening, Harriet and the moon become fast friends. Worried that he'll catch a chill, Harriet buys the moon a soft woolen hat, then takes him on a boat ride across a glistening lake, something he's only dreamed of. But can she work up the courage to play her music for the moon? ERIN and PHILIP STEAD are an award-winning picture book team. Their book A Sick Day for Amos McGee (400,000 plus copies sold to date) won the Caldecott Medal and was named a New York Times Best Illustrated Book and a Publisher's Weekly Best Children's Book. Other popular books include Bear Has a Story to Tell, an E. B White Award Honor Book. Most recently they collaborated with Mark Twain on The Purloining of Prince Oleomargarine, a major New York Times Bestseller and the recipient of much major media attention including profiles on CBS Sunday Morning and The New Yorker. They live in Michigan.